This week is moving by and I’m okay with that. It’s been another stressful one with a lot going on at work, home and with family giving me not as much time for posting as I’d like. Cramming in everything that needs to be done at home, exercise, and work has been a mess the last few weeks. Work has been terrible because so many people in our department have been calling in sick, half our team is down while we’re filling in for others. Time flies, but I feel like mush at the end of the day. Every evening I’ve been banging out “to do” list of chores, bill paying, shopping, cleaning and by the time I work in exercise, I don’t have time or energy to watch even one TV show which seems ridiculous for someone who’s child free and has fairly easy work hours. There must be a better way and next week I plan to start experimenting to find it. I did cram in a few minutes to look at the paper last night and came across this disturbing study. “The long term difference in body weight in the intervention and control groups suggest that there is an extended effect on fat mass after a short period of large food consumption and minimal exercise” said Asa Ernersson, who led the research. The study suggests that slacking on exercise and living a little large diet-wise while on a vacation or over holidays can have a lasting effect on weight … for years! That the metabolism does not rebound as quick as I’ve previously thought. Not that I’ve binged like this recently, but has always thought slacking a bit for vacations wasn’t a huge deal. But apparently it is. Eek! Anyway, as you can imagine with the chaos of this week, my eats have not been too exciting – another bummer to me. Lots of thrown together salads for lunch like this messy mountain. 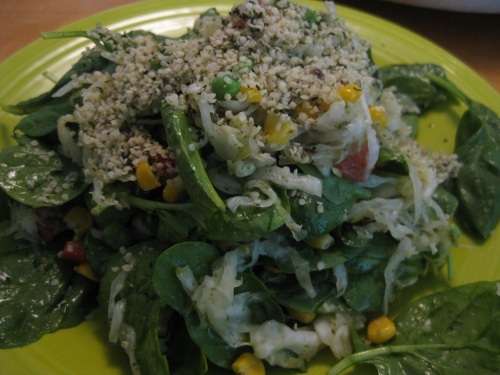 Spinach, corn, peas, red pepper, sauerkraut and hemp seeds dressed with a little toasted sesame oil and lemon juice. Simple, reliable, but not ground breaking or exciting. 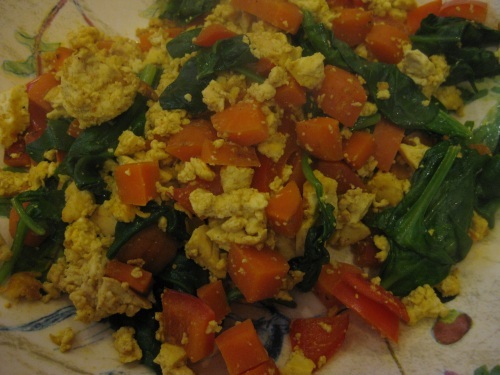 I did cram in another new recipe for dinner that was new grounds for me and a wonderful hit – Gena’s Classic Tofu Scramble. 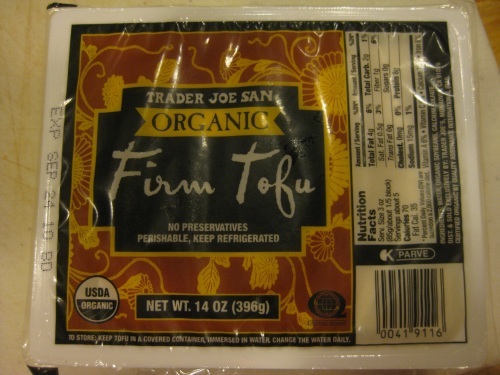 I’ve never been a huge tofu fan because it is flavorless by itself and the basic stir fry dishes my mom did with it growing up were just okay. But the mush lifeless texture of straight-up stir fried tofu was hardly appealing to me as a child. 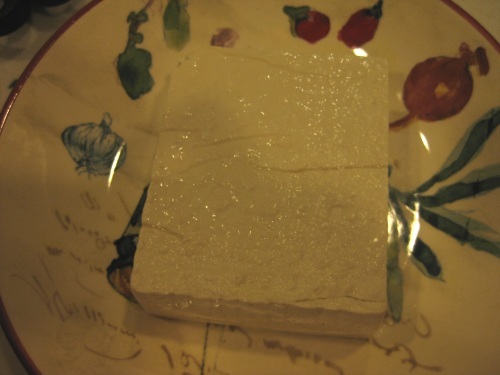 So, using 2 pasta dishes and one of hubby’s huge Statitical Analysis books, I smashed my block of tofu overnight in the fridge to squeeze out the excess flavorless water. I was surprised at how much water came out of it and what a difference in texture it made. The verdict? It’s a wonderfully tasty and simple recipe that’s appropriate for breakfast or a quick dinner. The texture and color were pretty close to scrambled eggs, I would never have guess it was the same mushy tofu. I doubled the recipe wanting to use the entire tofu block and took the leftovers to my mom who was thrilled with it and ecstatically told me how much this tasted like eggs. The women is a serious fan of eggs, so that’s saying a lot. Give this recipe a try even if you’re not a tofu fan. Wow, that metabolism/vacation thing IS a little scary!! My eats always get repetitive when I have busy weeks too– no worries! the vacay/metabolism info is surreal! how can that be?! Ok just talking about loud but yeah, very interesting! 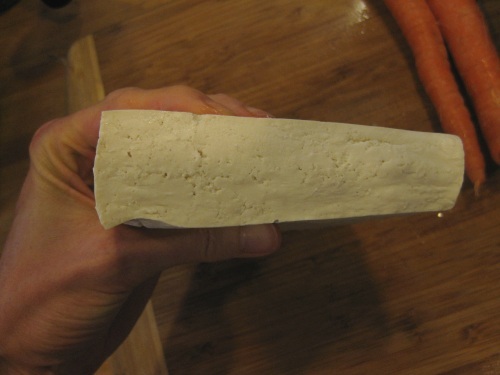 pressing tofu is the difference bewteen me being able to eat and enjoy it…and not. I cannot stand mushy and/or watery tofu…blech!!! Your irs double income story…omg. I cannot believe that. I am currently dealing w/ them about a 1st time home buyers credit. I have no idea if i will ever get it and so far have spent about 50 hrs trying to send them paperwork. Oy vey they are so inept! Omggggg that article on metabolism is scaring me… I’m currently out of action due to a stress fracture on my forefoot and am eating a mountain of fatty fruit and raw desserts everyday. Hmm but I guess we don’t have to worry that much on a raw food diet, since what we’re eating is still a 100% much healthier than the very highly processed, artificial chemical-filled, edible foodlike substances in the supermarkets. 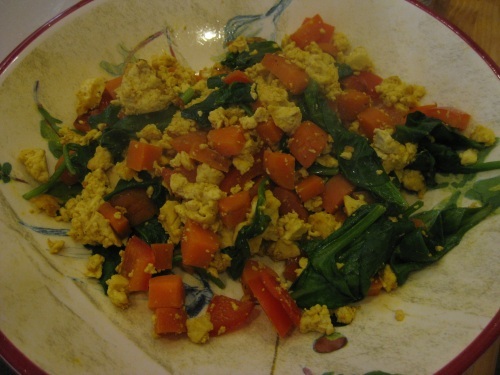 :) The tofu scramble looks great, btw! You’ve inspired me to try it out, though I don’t like tofu all that much! I had no idea you could smash it to get a better texture. Thanks for the tip! No one needs the grey flavorless water!